Archpriest John J. Udics, 67, fell asleep in the Lord as a result of complications from surgery at the University of Pennsylvania Hospital here on Wednesday afternoon, February 3, 2016. Born February 11, 1948 in Cleveland, OH, the son of Joseph and Mary [Konet] Udics, he and his family were parishioners of Saint Theodosius Cathedral, where he attended Christian education classes, assisted as an altar server, sang in the choir, and rarely missed a service. A talented musician, he played piano and several wind instruments and had a wonderful singing voice. After high school, he attended The College of Wooster, Wooster, OH, for one year before transferring to Iona College, New Rochelle, NY while also enrolling at Saint Vladimir’s Seminary, Yonkers, NY. He received a B.A. from Iona in Philosophy. He also was fluent in French, Japanese, and Russian. During his final year at Saint Vladimir’s, he worked as an intern at the Holy Ascension of Our Lord Cathedral, Unalaska, AK. He also participated in the Ecumenical Institute of the World Council of Churches at Bossey, Switzerland. After completing his education, he taught French at Sheldon Jackson College, Sitka, AK. He also worked in Alameda, CA and and Portland, OR. When seminary classmates informed him of an opportunity to work in Japan, he relocated to Tokyo, where he taught English to Japanese students for several years. While in Japan, he was ordained to the diaconate at Tokyo’s Holy Resurrection Cathedral (Nikolai-do). After returning to the US, he found himself at Saint Tikhon’s Seminary, South Canaan, PA, where he conducted research for his thesis to complete the requirements for his Master of Divinity degree. While there, he worked in the seminary library, served as a deacon at the monastery church, and later was elevated to the dignity of protodeacon. It was at Saint Tikhon’s that, on January 30, 1985, he was ordained to the priesthood by His Grace, Bishop Herman of Philadelphia and Eastern Pennsylvania. He was assigned Rector of the Assumption of the Holy Virgin Church, Philadelphia, which he served until 2009, when he relocated to South Plainfield, NJ as Pastor of the Nativity of the Blessed Virgin Ukrainian Orthodox Church. In 2010, he was assigned Pastor of Herkimer’s Saints Peter and Paul Church, which he served until his repose. Father John will be remembered as a dedicated and charitable priest who was always concerned about the spiritual well-being of his flock, as well as those outside his parish. He was very knowledgeable about the spiritual life and matters concerning the Church. He had a great gift for preaching and teaching in an accessible manner so that all people could understand. He also put much effort into writing articles to teach people about Christ and the Church. A driving force in the greater Philadelphia Orthodox Clergy Brotherhood, Father John encouraged unity and cooperation among Orthodox jurisdictions, developing many enduring relationships with his brother priests and lay people. He also served as a volunteer police chaplain with the Philadelphia Police Department’s Clergy (Chaplain) Program which provides care to members of the police department and their families. He especially valued riding with police officers as they performed their work in the community. Father John’s entire life was devoted to loyally serving Christ and His Church. He had a kind heart and a contagious sense of humor. He was a pastor, teacher, counselor, and mentor to many people, who will miss him immensely. Father John is survived by three sisters: Rose Udics (Jim Gomes), Arlington, MA; Margaret Kappanadze (Archpriest Jason), Elmira Heights, NY; and Mary Ray (Ron) of Kirtland, Ohio; four nieces and three nephews; one great-niece; and several God-children. Visitation will be held at the Assumption of the Holy Virgin Church, Philadelphia, on Tuesday, February 9 at 7:00 p.m. A Memorial will be celebrated at 8:00 p.m. On Wednesday, February 10, visitation will continue at Saints Peter and Paul Church, Herkimer, NY at 7:00 p.m. with a Memorial at 8:00 p.m. 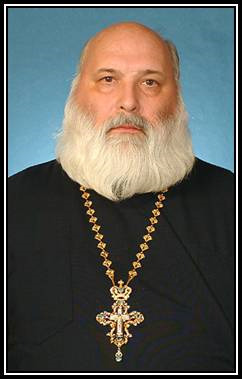 The Funeral for a Priest will be celebrated at the Monastery Church of Saint Tikhon of Zadonsk on Thursday, February 11 at 7:00 p.m., while the Divine Liturgy will be celebrated on Friday morning at 9 a.m. with the Hours starting at 8:40 a.m. Interment will follow at Saint Tikhon’s Monastery Cemetery.